'As confirmed in our previous response (RFI20091032), Roger Wright is contracted to undertake the combined role of 'Controller, R3 & Director BBC Proms'; therefore, each role is not treated separately in terms of length of the contract/conditions of service. I can conform that Roger Wright is currently on a permanent standard Senior Manager contract with the BBC in the above role; there is no fixed tenure associated with this role'. 1. An annual Proms budget of £.8.8 million. Presumably the largest budget for a classical music festival in the world. 2. An annual budget of £36.6 million for BBC Radio 3. Presumably the largest budget for a classical music broadcaster in the world. 3. An annual new music commissioning budget of £350,000, which is included in 2. above. Presumably the largest classical music commissioning budget in the world. Is it appropriate for one individual, no matter how talented he or she is, to exercise this degree of control over classical music? If so, are there sufficient checks, balances and visibility in place for the role? I guess it all depends on how much you trust the BBC. 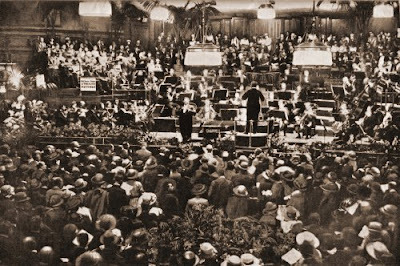 Photo of Henry Wood conducting a 1922 Promenade Concert was used in my post Before there were mobile phones. Any copyrighted material on these pages is included as "fair use", for the purpose of study, review or critical analysis only, and will be removed at the request of copyright owner(s). Report broken links, missing images and errors to - overgrownpath at hotmail dot co dot uk. V1.1 28/08. This article is worth a read. Note it wasn't published in the Guardian where BBC Radio 3 presenter Tom Service writes. 'Other people are creating great content' says the BBC Radio 3 website, but, for reasons that totally escape me, omits On An Overgrown Path from the list of blogs writing about the Proms.